Reggae Sunday Brunch at Hero’s Lounge 3094 N. 35 Fwy. Dallas. 11am-3pm. Every Sunday Caribbean Breakfast & Lunch. Judicial Investitures for Civil Court Judges at Dallas Bar Association 2101 Ross Ave. 3:30 pm-4:30 pm. Zan Wesley Holmes Lunch and Learn Series Grant Writing Boot Camp at Frazier House 4600 Spring Ave. Dallas. 11:30 am-1 pm. Polk-Wisdom Branch Library Presents: Black History for Children Hip-Hop: Female Pioneers 7151 Library Ln. Dallas 4 pm. Friendship-West Baptist Church Pastor’s Haynes 31 Day Health Challenge Wednesday Bible Study Keeping it Green 2020 Wheatland Rd. Dallas. 7:30 pm. Black Love Ball Host: YBE at 921 W. Belt Line Rd. DeSoto. 7 pm-11 pm. Food, Music and lots of Prizes. Tickets: Eventbrite. Couples Only Valentine Dinner Party at Astute Gentlemen 14223 Inwood Rd. Farmers Branch. 7 pm-12 am. Tickets: Eventbrite. Dallas Black Dance Theatre Presents: Cultural Awareness “Dance Salute to Nina Simone & Odetta Holmes at Dee & Charles Wylie Studio Theatre 2400 Flora St. 15th 7:30 pm, 16th 7:30 pm, 17th 2:30 pm. Discover the Arts after Dark, African Drumming Night at Zula B. Wylie Library 225 Cedar St. Cedar Hill 6:30 pm. After hours spoken word and African drumming performance. January Lunch & Learn Series Class “Using Insurance to Create Generational Wealth” at Frazier House 4600 Spring Ave. 11:30 am-1 pm. Stroll off Competition/After Party TCAC Convention 2019 at Sheraton Hotel 1500 Convention Center Dr. Arlington 7 pm. Cheers to 30 Years Minister Dominique Alexander at African American Museum 3526 Grand Ave. Dallas 7 pm. 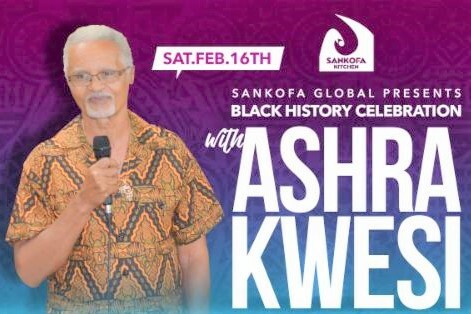 Sankofa Global Presents Black History Celebration with Ashara Kwesi at Friendship-West Baptist Church 2020 W. Wheatland Rd. Dallas. 7 pm. Tickets at Sankofa Kitchen. FSD Couples Night Out at Forever Swing Dallas Event Venue 2021 N. Hampton Rd. #175 DeSoto. 8 pm-1 am. Women’s Empowerment Brunch @ The Egg & I Restaurant 15203 Knoll Trail Dr. Dallas 11 am-1 pm. Love Jazz & Romance Jonathan Butler Feat: Pieces of a Dream at SMU McFarlin Auditorium 6405 Boaz Ln. Ste 101 Dallas 7 pm. Coffee & Politics 101 Police Review Board at African American Museum at Fair Park. 10 am-11 am. The Relief Session Presents: Smokin’ Word Ladies Addition at Blowin Smoke Cigar Lounge 215 W. Camp Wisdom Rd. Ste. #5, Duncanville. 8 pm-11:30 pm. Eventbrite. Ms. Vicki & Friends Love & Laughter: A Red & White Gala Affair at Hilton Garden Inn 1001 W. Pres. George Bush Turnpike, Richardson. 6 pm Tickets: Eventbrite. Black Police Association Community Town Hall Meeting Police 101 at The Black Police Association of Greater Dallas 211 Center St. 2 pm-5 pm. Complimentary Military Women Lunch: Boots to Business at Holiday Inn 725 Plaza Dr. 2900 E. Hwy 114, Trophy Club. 10 am-1 pm. New Membership Queenish Professional Women’s Club at DeSoto Market Place 324 E. Belt Line Rd. 2 pm. Red Alert! Celebrating the Stars Among Us at The Manderley DeSoto 2010 N. Hampton Rd. Ste. 700. 7 pm-11 pm. Gospel Fest 2019 at Faith Bible Church 1437 W. Pleasant Run Rd. DeSoto. 4:30 pm-6:30 pm. Citymen Cook Presents: Mentors Mixer at J. F. Keg & Kitchen 1701 Young St. Dallas 2 pm-5 pm. Dallas in the Time of Martin Luther King, Jr. at Hall of State 3939 Grand Ave. 1:00 pm. Grand Opening South Dallas Training Center in Partnership with Intercity Community Development, Richland College & El Centro College at South Dallas Training Center 4915 Brashear St. 9 am-9:45 am. Info: 214-915-9900. Lunch and Learn The Taste Of Success at Redbird Entrepreneur Center 3662 Camp Wisdom Rd. Dallas. 11 am-1 pm Contact: Clifton Ellis Johnson 214-636-7516. Zan Wesley Holmes Lunch and Learn Series Cryptocurrency Tokenization Case Studies at Frazier House 4600 Spring Ave. Dallas. 11:30 am-1 pm. Polk-Wisdom Branch Library Presents: Black History for Children Rock & Roll: Male Pioneers 7151 Library Ln. Dallas 4 pm. Polk-Wisdom Branch Library Presents: Adult events Celebrating Black Culture: New Movie Tuesday 7151 Library Ln. Dallas 5:30 pm.